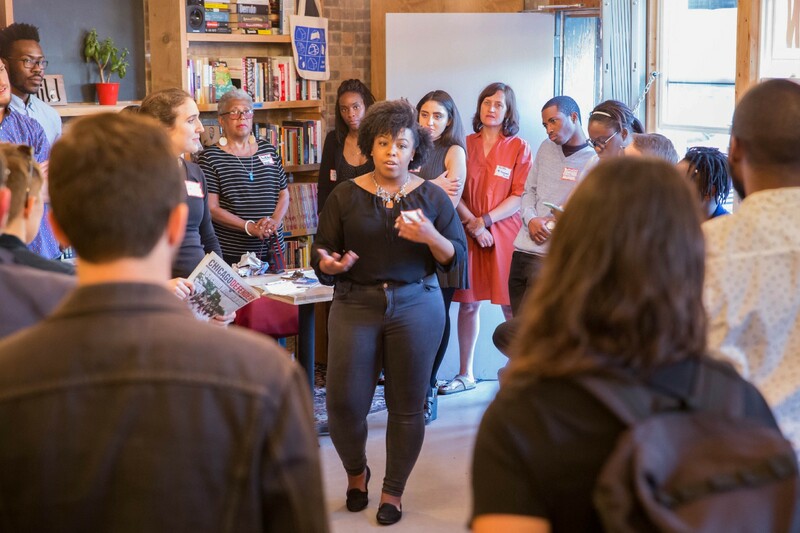 City Bureau Spring 2017 fellow Sierra Council describes her reporting process to a group of readers, supporters and Chicago youth at an open house hosted by City Bureau at Build Coffee. For decades, there was an implicit contract between American news media and its audience: readers flock to content, drawing advertising dollars — and those dollars subsidize news, information and watchdog journalism. It’s no novel observation that disruptive forces have left this relationship out of alignment, and public interest journalism has suffered. Now, a new contract is needed: a commitment that reframes the traditional consumer-producer relationship into one of co-creation, with journalists and communities working together to produce this essential public good. In January, a Gallup/Knight Foundation survey of 19,000 U.S. adults found that 84 percent say news media is “critical” or “very important” to our democracy — and at the same time, 43 percent believe the news media is doing a “poor” or “very poor” job filling that role. When asked who is primarily responsible for making sure Americans receive an accurate and politically balanced understanding of the news, the same study found a public split down the middle — 48 percent of Americans said the news media, while an equal percentage said members of the public themselves held that responsibility. If journalists were lawyers, these results would be akin to nearly half of the country preferring to represent themselves in court. This split shouldn’t come as a surprise. As in any good democracy, the news media earns the trust of the people by accurately representing them, yet we hear over and over that whole swaths of the country feel misrepresented in media. Even worse, some don’t see themselves reflected in our public narrative at all. The 48 percent of the public who place their trust in people over the press to ensure Americans get an accurate and balanced understanding of the news are onto something; we’ll define them here as the news media’s monitorial citizens. The monitorial citizen in a democracy is described by Columbia Journalism School professor Michael Schudson as a person outside of the dominant political structure who feels a responsibility to monitor what powerful institutions do, and to get involved when they feel power is being abused. In Chicago, some of the shape and color of these media-oriented monitorial citizens was illuminated in a December 2017 Chicago News Landscape study, a survey of 900 Chicagoans and their perceptions of local media, published by the Center for Media Engagement in partnership with City Bureau, a Chicago-based civic journalism lab. 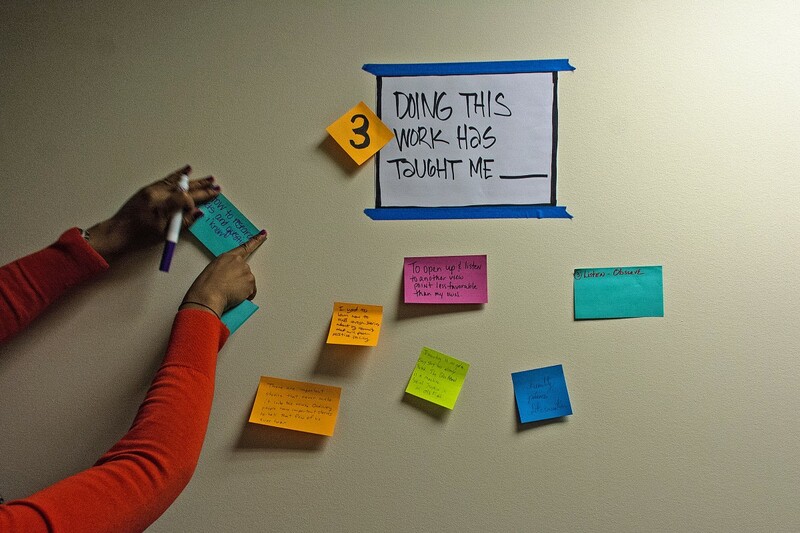 In March, City Bureau convened 35 Documenters to refine and build the program. They found Documenters don’t identify as do-gooders; they identify as citizens. The study showed striking differences in perception of media that correlated strongly to racial and ethnic communities in the city. South and West Side residents (composed largely of Black and Latino/Hispanic Chicagoans) were more likely than North Siders (identified largely with the city’s white population) to say stories about their neighborhoods were too negative. They were more likely to say stories about their neighborhoods “quote the wrong people” and were less likely to agree that stories about their neighborhood “do a good job of showing what is going on” than their North Side counterparts. Additionally, South and West Siders were less likely to have ever been contacted by a journalist than residents of Chicago’s North Side and Downtown. Yet, in a surprising turn, despite feeling poorly represented by — and disconnected from — Chicago news media, the same study found that South and West Side residents were significantly more interested in taking action by volunteering with local news outlets in the production of local news and information (43 percent of North Siders compared to 64 percent of South Siders and 67 percent of West Siders). The feeling of being under-represented or misrepresented in the public narrative isn’t new, but this study reveals people’s desire to help create more equitable, engaged local media coverage. This demand is laying the groundwork for a new civic media, one that is free of an old burden — distrust from a public that has long felt misrepresented. New and replicable civic media initiatives are bridging gaps between journalism and civic life, like Free Press’s News Voices in New Jersey, which mobilized public support that led to statehouse introduction of the Civic Info Bill; Outlier Media, which delivers service-oriented journalism on demand to low-income residents of Detroit; and City Bureau’s Documenters Program, which pays and trains members of the community to document local public meetings that are increasingly under-attended and uncovered by local media. Media-oriented monitorial citizens don’t identify as do-gooders or citizen journalists. They identify as citizens who understand the value of reclaiming journalism and citizenship for the public. City Bureau’s Documenters are U.S. born, naturalized and undocumented. They’re civic actors, creators and collaborators representing a broad base of diverse, intergenerational communities. It’s through these kinds of intersectional efforts that the monitorial citizen is activated and engaged around equity, knowing that there are citizens who want to get involved, but have been locked out by powerful institutions and otherwise sidelined by mainstream public discourse. 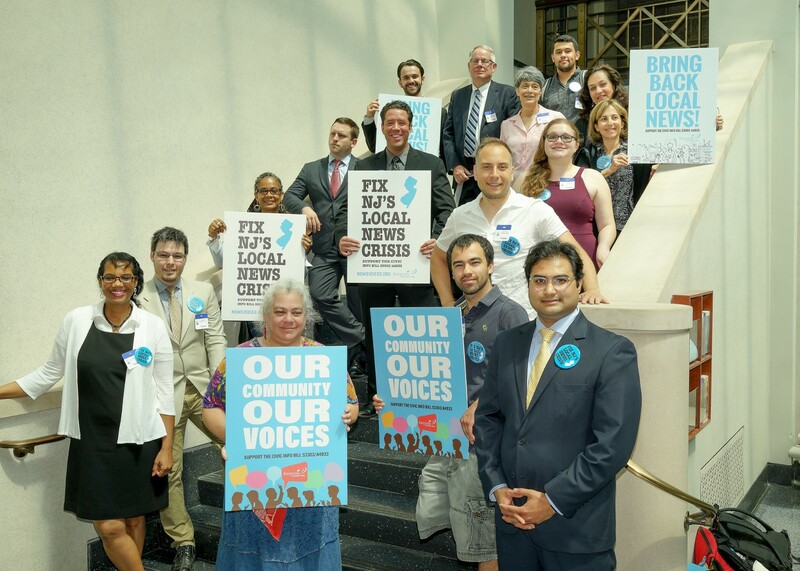 On June 1, 2017, the majority leaders of the New Jersey State Assembly and Senate introduced legislation to establish the New Jersey Civic Information Consortium. Journalism is a powerful institution that bears a critical responsibility in our democracy. Monitorial citizens have told us they are willing to share that responsibility in order to become more informed, engaged people — but journalists have yet to show their willingness to share that power in order to create a more effective, engaged journalism rooted in the public interest. Evolving from the “community journalism” movement of the 1950s, the “public journalism” school of the 1990s and the “citizen journalism” trend of the 2000s, a new kind of civic media can and should empower people to become knowledgeable information gatherers and distributors, and uplift them as trusted voices in their own communities. The new contract between journalists and the public will frame journalism as an act of citizenship rather than an entity for and separate from citizens. It’ll resist the urge to claim the role of ‘watchdog” as the sole domain of journalists — instead it’ll share that responsibility and work to shift the balance, engaging people in the production of news and information. It’ll train citizens to hold governments and powerful individuals to account by democratizing journalistic skills and broadening paths to the media industry. It’ll meet people where they are, not where they are most profitable. It’ll move beyond disruption and into repair, and in the process it’ll renew its mission as a public good. Our democracy will be better for it. Darryl Holliday is a journalist, multimedia storyteller and reformed crime reporter based in Chicago. He’s the Co-founder and Labs Director​ of City Bureau, a civic media lab based on Chicago’s South Side. 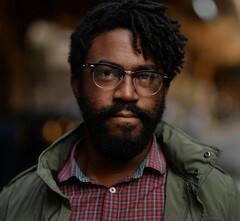 In 2011, Darryl co-founded Illustrated Press, a media production collective covering urban issues with comics, sequential art and traditional reporting. He’s been cultivating and supporting innovative approaches to media coverage, newsroom diversity and civic engagement ever since — formerly as a producer for the Invisible Institute and beat reporter for DNAinfo Chicago and the Chicago Sun-Times.